Dr. Russell S. Walters, III, of St. Albans, VT died peacefully of heart disease on August 10, 2017, at the St. Albans Health and Rehabilitation Center. He was 88. He was a scientist, woodworker, husband, father, grandfather, great-grandfather, and loving partner. Russell was born December 19, 1928, in Clinton, IA, to Russell and Irma (Scribner) Walters. During the depression his family traveled the midwest in a small house trailer as itinerant workers, eventually settling in Michigan where his father worked in support of World War II. His early experiences taught him the value of education and hard work and these values guided him his entire life. Russ graduated from Ludington, MI High School where he was a gifted athlete and earned the rank of Eagle Scout awarded by the Boy Scouts of America. During high school, Russ attended a lecture on forestry and decided to make it his life’s work. 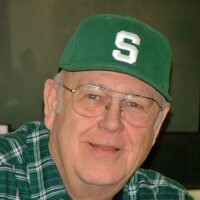 He earned his Bachelor of Forestry degree at Michigan State University, his Master’s degree in Silviculture at Oregon State University and his Doctorate in Forestry from the College of Environmental Science and Forestry, Syracuse, NY. He spent his entire career as a Research Forester with the USDA Forest Service where he published dozens of books and papers furthering the field of forestry management. His co-authored book, Medicinal Plants of Appalachia, is still widely used today by herbalists and natural healers. While his research covered many topics, from Christmas trees to oaks, perhaps his most notable work was done in Vermont where his research enabled the use of tubing for the collection of maple sap, vastly improving and forever changing the production of maple syrup. In the early 1950’s, Russ served in Europe as a corporal in the U.S. Army where he earned the Army of Occupation and National Defense Service medals. Over the years, Russ also served in several community organizations including The Elks Club, Veterans of Foreign Wars, American Legion, Friends of the Missisquoi National Wildlife Refuge, and as a volunteer firefighter. He is the former Grand Master of the Vermont Masonic Temple. He served on the Vestry of St. Luke's Episcopal Church in St. Albans. Perhaps the volunteer work that best describes his character is when he co-founded the “Toy Shoppe” in Warren, PA. Russ organized a group of retirees and trained them in woodworking so that every Christmas, handmade wooden toys were given to needy children. The group is still active today. Russell was predeceased by his mother and father, Irma (Scribner) Walters and Russell S. Walters II of Jensen Beach FL; his first wife Anita Mary (Baker) Walters of South Burlington VT; wife Anita (Marquette) Walters of St. Albans, VT; son-in-law Michael Baxter, and grandson Robert Walters. He is survived by his daughter Jane Walters-Baxter of Ferrisburgh, VT and her children Shannon Baxter and great-grandchildren Serenity and Michael of Syracuse, NY; Ian Baxter of Portland, ME, and Ryan Baxter of Swanton, VT. He is also survived by his son, Thomas and wife Mary Shannon Walters of Richmond, VT, and their children Nathan and Luke Walters. In addition, Russ is survived by stepsons Robert Marquette and wife Patricia, their son Steven; and Glenn Marquette, all of St. Albans, VT. He also leaves grandchildren Casey and Adam Marquette, and Erica Washburn. Additionally, he leaves his special companion of many years, Priscilla Carpenter of St. Albans, VT.
A Celebration of Life for Dr. Russell S. Walters will be held at Holy Trinity Episcopal Church, 38 Grand Ave, Swanton, VT on August 19, 2017 at 4:00 p.m., officiated by The Rev. J. Robert Spainhour, Holy Trinity Episcopal Church, Swanton, and The Rev. James Ballard, Deacon, St. Luke's Episcopal Church, St. Albans. A reception will follow in the parish hall. The family wishes to thank the staff of St. Albans Health and Rehabilitation Center for their care and compassion for Russell during his illness. Arrangements are entrusted to the Brady & Levesque Funeral Home and Commemorative Services where online memories and condolences may be shared with his family at: www.bradyandlevesque.com.